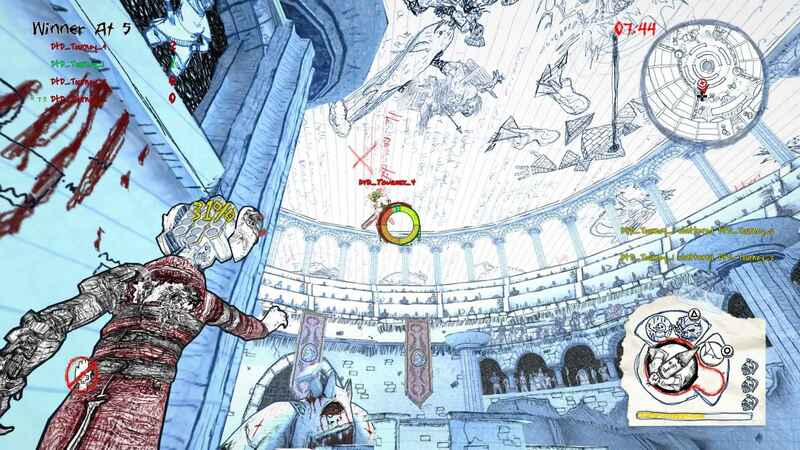 The best thing Drawn to Death has going for it is the aesthetic, which thoroughly lives up to its promise of vast, wild worlds crafted from the classroom notebook scribblings of a teenage delinquent. It’s a world of kittens controlling giant robots, unicorn/teddy bear/cyclops abominations, and hideous caricatures of classmates and bullies. The stars, of course, are the playable characters, ranging from comparatively milquetoast designs like a murderous punk rocker named Johnny, to less conventional fare like a curvy female ninja with a shark’s head. 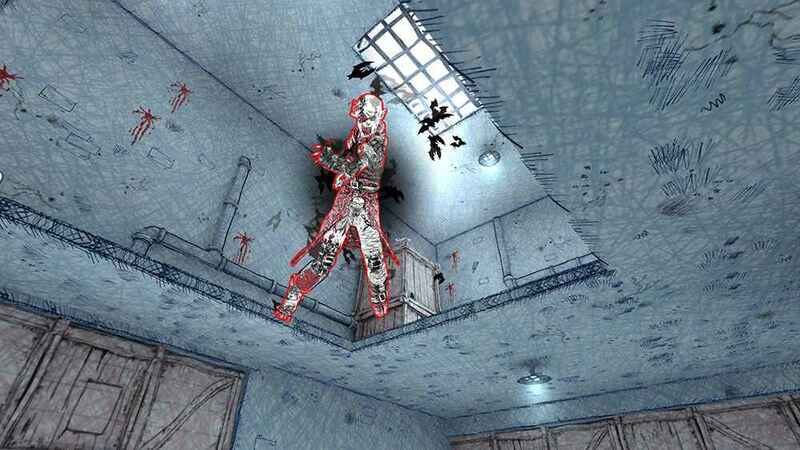 It’s a strong foundation and a perfect fit for the kind of Quake-alike third-person shooter revival the game seems to be aiming for, but it’s a combo that only seems to work–pun thoroughly intended–on paper. The poison in the well is obvious in the first 10 minutes. The tutorial is a chore just by having to endure a non-stop stream of unfunny trolling and insults. 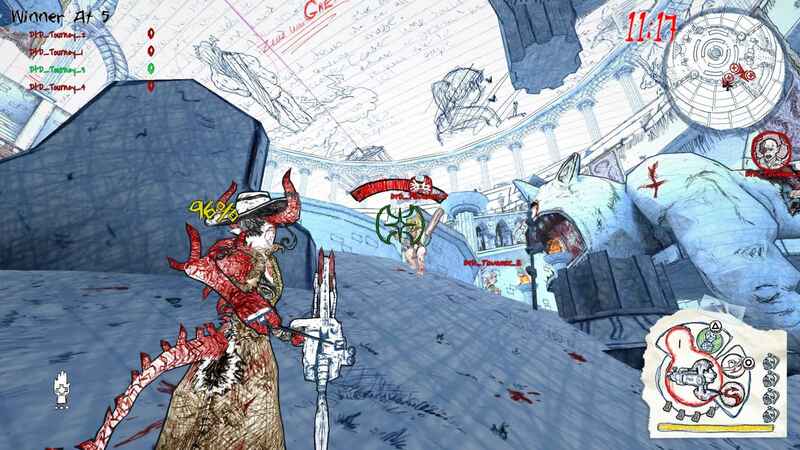 To the game’s credit, one sly prank Drawn to Death pulls here will have players looking like total fools and laughing about it later. By and large, however, Drawn to Death plays with swears like a child who just found Dad’s shotgun, and long after they’ve shot themselves, they keep wondering if the trigger will do something different next time. Beyond the tutorial, the game’s voiceovers berate you for doing nothing, utterly hate you for failing, and become flat-out obnoxious when you win, with the announcer ranting and raving nonstop. The fact that your guide for so much of the game is a dissected, effete British frog drawing almost makes it worse, since there’s comedy to be mined there, and yet this is the best the game can muster out of it. The “comedy,” as a whole, falls flat, with no sense of timing, nuance, or delivery. There’s just the assumption that the “adult humor” coming out of what’s ostensibly a cartoon is enough to count as cool and edgy–which wasn’t even that cool and edgy when Duke Nukem 3D was doing it 20 years ago. This would be grating if the game were actually a fun shooter, but it’s nigh intolerable considering the two-decade-old Duke Nukem 3D also feels better to play. While there’s some interesting stage design–with intricate papercraft temples, wastelands, and militarized neighborhoods–you’re still tromping through them with movement mechanics that feel like you’re on roller skates when on foot and like swimming in the ocean while jumping. Even though there’s a decent collection of weaponry to be used, including two special abilities for each character, you might as well be shooting paperclips at enemies for all the damage they deal. Showdowns with other players don’t rely on effective use of one’s arsenal but on grueling patience, as pumping bullet after bullet from weapon after weapon fails to whittle an opponent’s life to any degree. The special attacks are, again, well conceived, but they feel woefully underpowered, and more often than not, their projectiles just disappear into nothingness amongst all the visual clutter. But the only new element Drawn to Death brings to the table is a streak of ugly, juvenile misanthropy played less for comedy than for maximum annoyance and distraction. 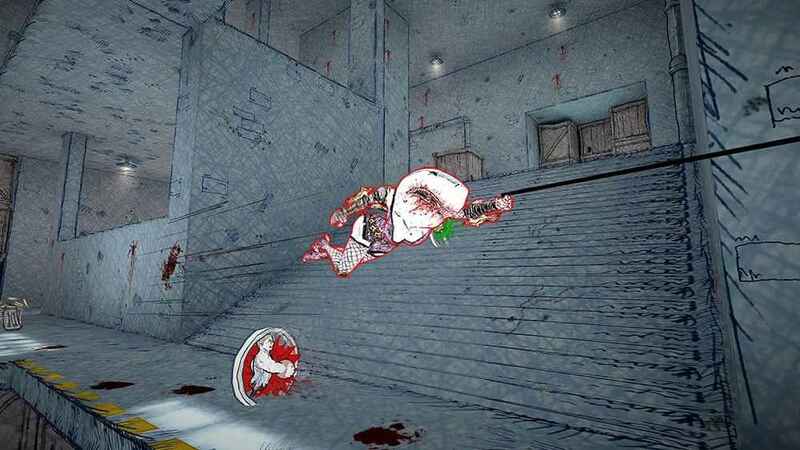 Drawn to Death does offer more powerful weapons, but so many are designed with “cool” factor in mind instead of user friendliness. One of the better ideas, a catapult in a coffin that fires corpses at high velocity, takes a good 10 seconds to load, rear back, and fire, which is just death in a game like this. The game’s sniper rifle is its most effective weapon, and already, early in the game’s lifespan, players have figured this out, rendering matches into lethargic Enemy at the Gates-style showdowns, instead of what should feel closer to a profane Ratchet & Clank. Therein lies the real problem, overall: For a game with such a unique conceptual starting point, the feeling that we’ve seen it all before in a smarter, funnier, and better way would be tragic enough as it is. But the only new element Drawn to Death brings to the table is a streak of ugly, juvenile misanthropy played less for comedy than for maximum annoyance and distraction. The narrative rewards for the player’s patience and proficiency don’t even remotely make up for the mental debt created by a game that puts up such a thick, garish barrier against anything resembling a good time. There’s a much different, more interesting game lingering within Drawn To Death, a stylish character study of the type of person who spends his nights posting dank animal-abuse memes on Reddit and breathing too hard into the mic before calling someone a “cuck” for playing Hanzo in Overwatch. The actual thoughts of “the Hand,” the human responsible for the edgelord line-paper wonderland of Drawn to Death, are everywhere in the game–in the backstories of each character, the sketches and random objects scattered throughout the game, in the descriptions of the game’s wacky arsenal, even in the names of trophies, which, put all together, read like a LiveJournal entry. We see a fairly normal kid who idolizes his brother, a serviceman, can’t gather the gumption to talk to a girl in his class, seems somewhat embarrassed about his interest in guns and knives, and uses the world of his notebook to brutalize and embarrass the things in reality that make life miserable. 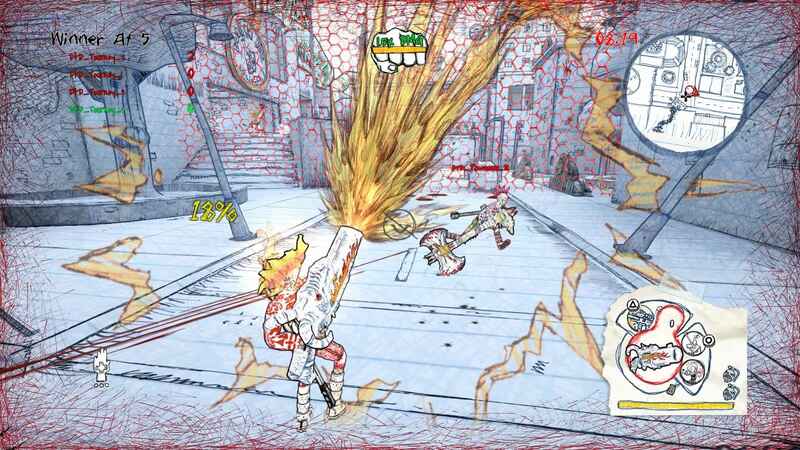 All this creates a funhouse-mirror image of screwed-up teenage gamerdom worth exploring with a measure of detachment, which makes it even more of a shame of the outdated, obnoxious shooter that never shuts up Drawn To Death actually is. Copyright © 2014 - 2019 SocksCap64, All Rights Reserved. Logos, Trademarks, Pictures Belongs To Their Respected Owners. Powered By WordPress. 82 Queries in 0.411 seconds.